Scenario: The daughter of billionaire Robert Gilmore, Reika Gilmore, is having a birthday. 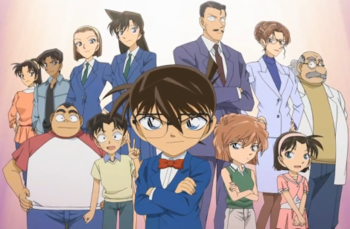 She has invited Kogoro, who brings Ran and Conan, as a special guest. A couple of partygoers introduce themselves as Reika's suitors. The party goes on throughout the night until people start heading home. The suitors start to head to their cars when they realize they have had their tires slashed. When all the guests have left, the remaining people are Reika, her suitors, Kogoro and party and the maid, Nonee. Reika suggests a game of cards to pass the time. Quentin Mifune, a suitor, declines and offers to chaffuer Kogoro home but is stopped by Reika who calls him a coward for not wanting to participate. Reika leaves the group, explaining she wishes to change into sleeping attire. After a few hours, she has not returned. The group splits up and searches for Reika. 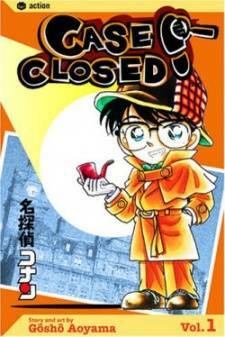 Conan and Kogoro stumble upon the corpse of suitor Steve Sloan, a victim of drowning. Reika, having not been found, is blamed. To calm everyone's nerves, Nonee and Ran volunteer to make tea. The tea is brought and enjoyed. Ran feels tired and the tea soothes her into sleep. Conan remembers the group was talking about an accident and believes it may have something to do with Steve's murder. The accident involved Reika, the suitors and Sonja, Nonee's granddaughter. Steve and Reika went missing during a storm. Sonja went looking for them. The two returned without Sonja who had drowned. During the night, Ran is attacked in her slumber and is nearly drowned. This wakes everybody up. She is dazed and it appears her tea was drugged with sleeping pills. One of the suitors make coffee but spills it on Conan and Kogoro. They go to wash in the bathroom only to find Reika, dead and the victim of drowning.